JULIAN GAMBLE dipped his shoulder and spun around Kenny Kadji in a flash. Gamble planted both feet, quickly rose toward the rim and threw down a powerful, emphatic dunk. Slam. Kadji couldn't help but scream while watching his former teammate from the University of Miami. "Don't bring down the rim, Jul'," Kadji yelled in excitement during a team practice at Aspiring Champions Gym near King of Prussia. "That'll cut into our winnings, man." Two minutes later, Marcus Lewis, the 2014 ESPN College Slam Dunk Champion from Eastern Kentucky University, took flight from the foul line and almost dunked on Garrius Adams from the 2013 ACC championship Miami team. Half a dozen players and two coaches filled the gym for some early practice on Wednesday for simply dubbed "The Basketball Tournament," which started yesterday at Philadelphia University. The championship will be June 28 at a site to be determined. Thirty-two teams will overrun the gym this weekend for the chance at winning $500,000, which is then split among the members of the winning team. John Mugar, founder of the event, said the process began 3 years ago to establish a new tournament in Philadelphia. "It's being financed from an investing group out of Boston," Mugar said. "The reason they're investing is because we hope to establish this as something that is broadcast-worthy, and we would like to give out the premise of an open basketball tournament and make it valuable to sponsors or anyone interested." The notable teams in the field include one composed of members of the 2009 Villanova team that reached the Final Four, including Reggie Redding, Scottie Reynolds and Dante Cunningham, who now plays for the Minnesota Timberwolves. Another team is made up of former Saint Joseph's stars; another squad includes eight former players from City 6 teams, such as La Salle's Dalton Pepper and Aaric Murray; and a Cornell team that made the Sweet 16 in 2010. Another team named "Rep Your City" is headlined by Delaware 87er Aquille Carr, Lewis, Gamble, Adams and Kadji. Matt Gibson, their coach and a writer for Dime Magazine, brought his team to Philly 2 days early to get some practice in. Gibson said he got his team together because of some connections he made through journalism. "After 2 days of practice, we'll be in great shape to make a serious run in the tournament," Gibson said. "No one picked us to win the tournament, but we have a confident bunch and there are clusters of guys that have played together in college and professionally. Having some type of organization in an event like this can go a long way." Mugar thinks that a tournament such as this, which promotes the idea of "team basketball" more than anything else, could be a mainstay in Philly if received well. "Realistically, and as a basketball fan, I want to see how team basketball levels up with supremely talented players," Mugar said. "Having a winner-take-all prize really puts the emphasis on team basketball. It's purely paid to win. There's no emphasis on statistics. The box scores don't mean as much as the final score overall. I can't say I have a favorite, but I am interested in how it plays out." For more information, visit www.thetournament.com. Imagine, a five-on-five, single elimination, winner-takes-all contest open to anyone and offering a $500,000 grand prize for the last team standing. Now imagine 32 teams consisting of former college stars, with each team having something of a regional/program flavor. One group features former college stars Hakim Warrick and Marshall Henderson (Team TYGTAL), another team has the stars of the 2010 Cornell Sweet 16 run, yet another contender contains the studs from legendary H.S. program St Anthony's (N.J.), and there is also a squad that reunites Villanova's 2009 Final Four team, including major names Scottie Reynolds, Dante Cunningham, Corey Fisher and more. Today the qualifiers were announced. And the team that UM fans will want to watch the most is the one knows as "Rep Your City" as it will have former 'Canes Kenny, Kadji, Julian Gamble, & Garrius Adams among its key players. Aquille "The Crimestopper" Carr has so many hits on his YouTube highlight video that you’d expect him to already be a household name across the country. Carr, a 5’6", 20 year old point guard who got his nickname because it’s said that crime in the streets of Baltimore came to a stop when he played his high school games, recently declared for the NBA draft after a stint in the D-League. Carr will be passing the ball to a talented group of former teammates from 2 different D1 schools: Miami and Coppin State. Three of the best Hurricanes of recent years, Kenny Kadji (6'10" PF), Julian Gamble (6'11" C), and Garrius Adams (6'6" SF) bring height, athleticism, and big game experience to RYC. Former Coppin State standouts Akeem Ellis, who starred in his rookie season with the Rio Grande Vipers (D-League) and Tony Gallo, who has been playing professionally in Canada after averaging 17 ppg his senior year, is, like Carr, another explosive point guard, with a pick-pocket’s stealth on defense. Rep Your City also boasts former Kansas State big man Jordan Henriquez and Akeem Williams, who led the UMASS-Lowell River Hawks in their jump to D1 this past season, scoring 2,000 points in his career. 6’8" PF Dartaye Ruffin was a key contributor to Drexel’s team for 4 years and was named to the CAA all-rookie team after his freshman season. GM Matt Gibson, himself a former captain at D3 Lesley (Boston), spent the past season as a graduate assistant at Emerson College under former BC and Ohio State coach Jim O’Brien. Gibson also contributes to Dime Magazine and will undoubtedly use some of the connections he’s made to garner more Fan support for Rep Your City going forward. With the talent and names on this Team, getting attention, and advancing, seem likely. NBA proCane F Kenny Kadji was signed on Saturday by the Rio Grande Valley Vipers of the NBA Development League. Kadji was in the Cleveland Cavaliers training camp before being cut. The Cleveland Cavaliers have waived center DeSagana Diop, forward Kenny Kadji, guard Jermaine Taylor and guard Elliot Williams. The Cavaliers' roster now stands at 15. Kadji played in seven preseason games with averages of 5.0 points and 1.7 rebounds in 9.4 minutes per game. Taylor averaged 5.7 points, 1.3 rebounds and 1.9 assists in seven preseason games. Williams played in six Cavs preseason contests, averaging 2.5 points and 2.2 rebounds in 7.9 minutes per game. Rookie power forward Kenny Kadji got more than 50 texts after scoring 15 points in his NBA debut on Tuesday night as the Cavs beat the Milwaukee Bucks, 99-87, in the preseason opener at The Q. The Cavs are in the market for another big, especially with the uncertain status of Andrew Bynum, who has yet to be cleared for five-on-five basketball. Kadji, who certainly looked more viable on Tuesday than veteran DeSagana Diop, would like to stake his claim and figures his energy can only help him. As a 25-year old rookie, Miami graduate Kenny Kadji was completely overlooked coming out of college, going undrafted. The Cleveland Cavaliers picked him up for the Summer League squad, and Kadji has impressed many. What other teams saw as an age concern, Kenny Kadji sees as a developmental benefit, meaning Kadji aims to contribute immediately. In his preseason debut, Kadji showed this with a 15 point, five rebound performance. And Kenny Kadji may be exactly what the Cleveland Cavaliers need. Kadji is just shy of seven feet, and with his three-point potential (37% in his two years with the Hurricanes), Kadji can find a nice place in the front court as a long range threat, shared only with rookie Anthony Bennett who will presumably see action at the three and four spot; Bennett, however, is only 6’8. 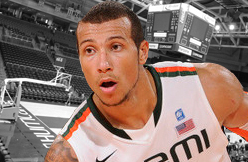 And at 6’11, Kadji is a decent shot blocker, averaging 2 blocks per game with the University of Miami. This summer with the Cavaliers, Kadji has showed he can bring energy to the court and make an effort on the boards. Kadji is seen to have a high basketball IQ, and with his ability playing the pick-and-roll, Kadji could find himself playing decent minutes running the pick-and-pop with Kyrie Irving, showing off that three-point range. While Kenny Kadji’s second preseason game was lackluster, he did go 4-4 from the line and block a shot in his nine minutes of play against the Orlando Magic. I’m excited to see how Kadji will respond in Tuesday’s game against the Charlotte Bobcats, as well as how the preseason will pan out for him. With the health uncertainty that the Cleveland Cavaliers’ front court has seen in recent times, Kadji is a great asset for the Cavs to keep around. He fits right in with the youthful spirit of this Cleveland team and hopefully his maturity as a rookie will allow Kadji to see minutes early on. INDEPENDENCE: Of the 50 or so text messages that Kenny Kadji received following his impressive performance in Tuesday’s preseason opener, his favorite came from his mother, Annie. “You’re still not that good,” she wrote to him, a loving reminder not to get too impressed with himself after scoring 15 points and grabbing five rebounds in 12½ minutes during the second half of a 99-87 victory against the Milwaukee Bucks. Kadji is in the hunt for the final roster spot on the Cavs, but coach Mike Brown warned that his scoring outburst in the second half doesn’t necessarily push him ahead of Henry Sims in the battle to be one of the Cavs’ big men. Sims’ final line of four points and a rebound in 6½ minutes is far less impressive, but Sims is a little more of a true center than Kadji, who can play in the middle, but whose game is better suited at power forward. Brown said that’s the reason Sims was the first off the bench in the competition between Kadji and DeSagana Diop. He needed a center to play alongside rookie Anthony Bennett so he went with Sims, whom Brown says does a lot of the little things well that don’t necessarily show up in a box score. And with a detail-oriented coach like Brown, the little things are more important than a few extra points, since the minutes Sims and Kadji are vying for will be extremely limited barring an injury. In fact, the need is more at center than power forward, since the Cavs already have Tristan Thompson, Anthony Bennett, Anderson Varejao and Earl Clark all capable of playing power forward. Given the injury histories of Andrew Bynum and Varejao, the Cavs ideally would like to carry another center in case injury again inevitably strikes. That’s part of the reason they brought Diop to camp, but Brown didn’t play Diop until the final 3½ minutes of Tuesday’s scrimmage and it was immediately clear why. Diop labored getting up and down the floor, and it’s now apparent the 12-year veteran doesn’t have much of an NBA career left. Kadji, however, got up 11 shots in a short amount of time (thanks to grabbing the rebound on a couple of his own misses), and he grabbed four offensive rebounds. Kadji led the Miami Hurricanes to an ACC title last season and then went undrafted in June, in part because he’s already 25 years old — he’s only seven months younger than Bynum. Kadji was born in France but spent most of his childhood in Cameroon, Africa. When he moved to the United States for basketball, some of his grades didn’t transfer and he was forced to attend IMG Academy. By the time he was able to choose a college, he began at the University of Florida before transferring to Miami, which forced him to sit out a year. He also received a medical hardship from the NCAA following back surgery during the 2009-10 season. Add it all up and Kadji is already considerably older than most NBA rookies, which could’ve played a role in him going undrafted. Kadji had offers to play overseas, but declined. He played on the Cavs’ summer league team and was eager to accept the invitation to training camp. “I wanted to take a shot at my dream,” he said. He presumably isn’t doing this for the money. His father, Gilbert Kadji, heads the group that produces Kadji-Beer. It is not distributed in the U.S., but is wildly popular in Cameroon similar to how Budweiser is viewed by Americans. Gilbert Kadji is reportedly one of the wealthiest men in Cameroon, and the family owns a home in West Palm Beach. His mother, Annie, will attend the Cavs’ preseason game Friday at the Orlando Magic. Kadji and Sims are believed to be fighting for one roster spot, although the Cavs could conceivably keep both of them at the expense of a third point guard such as Matthew Dellavedova. Alonzo Gee (hamstring) was a full participant in practice Wednesday, but Brown said it was a noncontact practice. Tyler Zeller was again a limited participant as he recovers from a strained hip. Neither Gee nor Zeller played in Tuesday’s preseason game, and it’s too early to tell if either will be available for Friday. But their injuries, along with the absence of Bynum, could postpone any roster cuts until next week simply because the Cavs need the extra practice bodies. INDEPENDENCE: Kenny Kadji had the better stat line, but that doesn't necessarily mean he has pulled ahead of Henry Sims in competition for the final "big" spot on the roster. Kadji had 15 points and five rebounds in 12 1/2 minutes Tuesday, while Sims had 4 points and a rebound in 6 1/2 minutes, but Cavs coach Mike Brown turned to Sims first and didn't play Kadji until the second half. Brown said not to read too much into his decision to go to Sims first, he just needed a center in the game to play alongside Anthony Bennett and Tyler Zeller was unavailable. Sims is more of a natural center than Kadji, but Brown thought Kadji could play center despite being more of a power forward. Where does all of this leave DeSagana Diop? Behind. That was obvious when Brown played him for the game's final 3 1/2 minutes, yet that was all it took for Diop to look exhausted. It doesn't look as if he has much of an NBA career left. If the Cavs fall in love with both Kadji and Sims, they could keep both of them -- likely at the expense of a third point guard like Matthew Dellavedova. It's probably more realistic to think Sims and Kadji are battling for one spot on the roster. As for Kadji, he said he received more than 50 text messages following Tuesday's game. His favorite, he said, came from his mother, Annie. "You're still not very good," she told him. Now that's motherly love. Undrafted forward Kenny Kadji has agreed to sign a non-guaranteed contract and play in training camp with the Cleveland Cavaliers, a league source told RealGM. Kadji, 25, turned down several substantial offers from European clubs to focus on starting his career in the NBA. He will travel to Cleveland next week to begin preparing for camp. Kadji was on the Cavaliers’ summer league team in July, averaging 5.6 points and 4.6 rebounds. 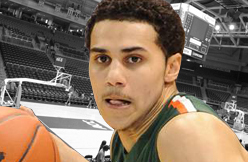 The Dallas Mavericks, having traded down twice, drafted former Miami Hurricanes’ PG Shane Larkin with the 18th overall pick in the 2013 NBA Draft. Having been technically drafted by the Atlanta Hawks with the 16th pick, Larkin will become a Maverick once the swap becomes official. 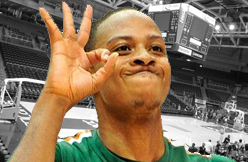 While at UM, Larkin averaged 14.5 ppg, 3.8 rpg and 4.6 apg. The 5-11, 176-pound guard was the 2012-13 ACC Player of the Year (Coaches, Sports Illustrated, ESPN), All-ACC First Team (ASCMA, Coaches, ESPN), All-ACC Defensive Team (ASCMA, Coaches) and ACC Tournament MVP. According to ESPN, the Mavs intend to keep Larkin for now, but should they need to create cap space for Dwight Howard, Larkin could be traded in July. Former UM PF Kenny Kadji was picked up on Friday by the Cleveland Cavaliers as a free agent. In his senior year, Kadji averaged 12.4 points, 6.1 rebounds, 1.4 blocks and 0.8 assists. He was voted Second Team All-ACC. University of Miami basketball coach Jim Larrañaga plans to watch Thursday’s NBA Draft from his bed, where he will be recovering from oral surgery. Despite the discomfort, he said he will force himself to smile as at least two former Hurricanes — point guard Shane Larkin and forward Kenny Kadji — are expected to be drafted. Larkin is considered such a lock he was invited to Brooklyn’s Barclays Center for the draft ceremony, where he will be sitting in the audience with his family. The last time two UM players were picked in the NBA Draft was 1970, and they were selected in the 10th round (Don Curnutt) and the 15th round (Wayne Canady). This time, Larkin is projected to go in the first round — somewhere between No. 13 and No. 21 — and Kadji in the middle to late second round. Their UM teammates, Durand Scott, Julian Gamble, Reggie Johnson and Trey McKinney Jones, probably will go undrafted and have to latch on to an NBA summer league team or go overseas. All the UM players have spent the past few weeks working out and interviewing with NBA teams. Kadji worked out for 13 teams, and Larkin more than that. Larkin’s size (5-11) and Kadji’s age (25) are of concern to some teams, but both have impressed on and off the court. Larkin, who opted for the draft after his sophomore season at UM, tested off the charts at the NBA Combine with a 44-inch vertical leap — second-best of all-time at the Combine. His charisma and pedigree are also plusses. A few of the most popular mock drafts have Larkin going No. 14 to the Utah Jazz, No. 15 to the Milwaukee Bucks, or No. 16 to the Boston Celtics, where Larrañaga’s son, Jay, is an assistant and being considered for the head coaching job after the departure of Doc Rivers, who knew Larkin as a youth in Orlando. If he drops past No. 20, the Jazz might take him at No. 21, or he could wind up with Indiana at No.23. Larkin reportedly had a good workout with the Jazz. “It was good that I had to go out and play with bigger players. I’ve seen people say that, ‘His height, he can’t play defense, da da da,’ so I went out to prove that I can,” he told Utah reporters. Kadji is 6-11 and a good perimeter shooter, making him a coveted “stretch 4” player. Assuming they get drafted, Larrañaga said Larkin and Kadji will leave behind “a legacy” for the program, which will help with recruiting in years to come.